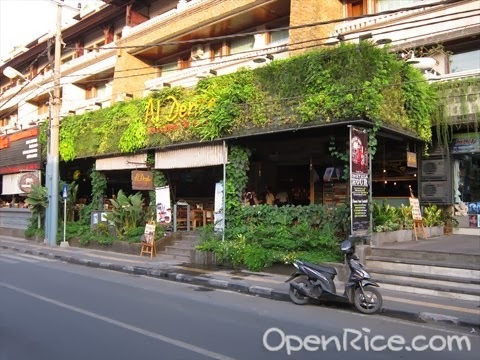 Sugoi Days: Indonesia: Bali Day 3 (Part 4) - Al Dente anyone? After a whole day out and on our feet, we felt that we deserved a good meal to mark our last evening in Bali. So after much debate, we agreed on Al Dente, an Italian restaurant and bar that was right next to Flapjaks and also under the same parent company as Flapjaks as I discovered later. To be honest, I wasn't expecting much from this place... and boy, was I glad to be proven wrong. Because holy crap, what a jem this place was! All three of us ordered pasta and living up to its name, the pasta came al dente topped with ample sauce and toppings. One friend ordered their clam aglio olio which was fair good for a simple dish as the clams were fresh and a lot. I ordered their Orecchiette con Funghi pasta that came oozing with cream and mushroom. I loved it so much that I lapped up everything. But the true winner of night was their Fettucini di Spinace al Ragu di agnello or in simple terms, lamb ragout. The base was made with fresh tomatos and mixed in with it was the delicious bits of lamb pieces. On top of that the pasta was handmade, giving it an added springy-ness in each bite. To top it off, it came served with a lovely sunny-side up. Coffee here was pretty good too and did compliment our pasta dishes well. The ambiance was quite dim to create a romantic effect but it can get a bit rowdy as there is a bar next door, also under the same roof as Al Dente. I can imagine on a slow night, this would be the place to go to for a romantic dinner date. Service was quick and efficient with the waiters willing to explain the dishes to us upon inquiry. Prices range from RM30 to RM150 for the main course, the average pricing of an Italian restaurant but to me, it was well worth it.